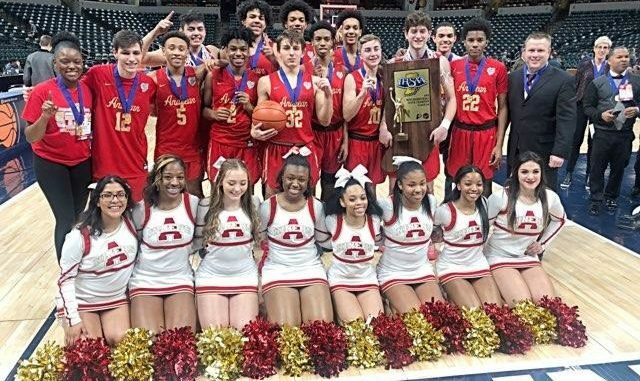 Andrean and Linton Stockton both returned to the IHSAA State Finals at Bankers Life Fieldhouse attempting to walk away with the IHSAA Class 2A state title firmly in their hands. We all know how it goes, only one team can walk away with the title and that title left with the blue medal of victory firmly clasped in their individual hands of Andrean. 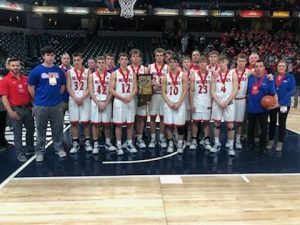 The Linton Stockton Miners still have only been able to secure two state runners up trophies in their visits to Banker’s Field House. But, the 59ers finally put the end to their runner up list securing a 59-54 victory over the Miners in Saturday’s second game. There was never much of a lead in today’s game, as the biggest lead was by the Miners in the 4th quarters with six points ahead. To help them win the game the 59ers went on a 11 point score run in the last minutes of the game after the Miners went to a ball control game. Kyle Ross and John Carrothers from the 59ers tied for the most points at 16 points a piece. 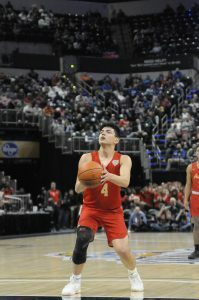 Carruthers was seven of eight from the charity stripe while Ross was five of eight from the field and five of six from the line while producing a team high seven boards. 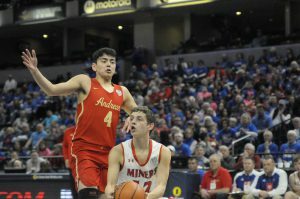 Tucker Hayes from the Miners led them with 15 points on six of eleven from the field while teammates Kip Fougerousse and Lincoln Hale both tallied eleven a piece. 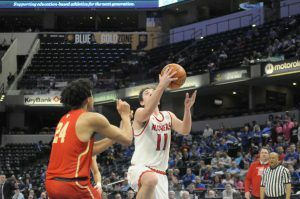 Linton-Stockton Senior Evan Slover was chosen for the Arthur L. Trester Mental Attitude Award. 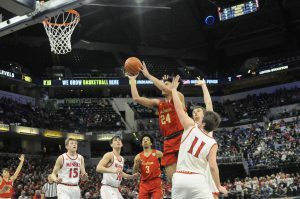 Andrean finishes 21 and eight while Linton finishes 27 and four.